Earlier this month the University of Houston community cut the ribbon on a new and improved stage at Lynn Eusan Park. This new stage will provide improved sound, lighting, better sight lines for audience members, and will inject new life into a park named in honor of one of UH’s own. 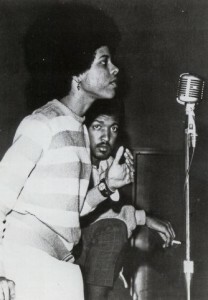 Lynn Eusan was a member of the Spirit of Houston, organizer of the Committee on Better Race Relations, founder of the Afro-Americans for Black Liberation (AABL), charter member of Alpha Kappa Alpha (UH’s first black sorority), and, probably most notably, the first African-American homecoming queen at UH and, as best we can tell, the first African-American homecoming queen elected in the South not from a historically black college. The year was 1968. College campuses around the nation were centers of dissent and quickly becoming laboratories for social change. 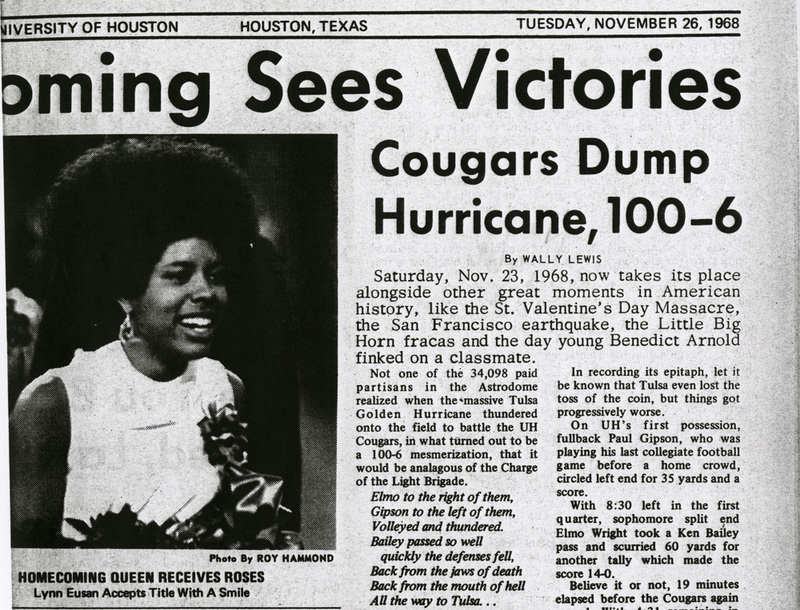 The University of Houston was certainly not Columbia, certainly not Howard, but if one thumbs through the Daily Cougar editions from the autumn of 1968, it drives home that the atmosphere on campus certainly reflected the ferment in Houston and other cities at home and abroad. In the midst of protests against police brutality, foreign policy, and parking fees (which I’m sure today’s students would find just shocking), the election of a homecoming queen seemed about the most apolitical and innocuous event taking place on campus. However, frustration was beginning to form as more and more students of different races seemed to be attending parallel universities separate from one another and the race for homecoming queen would become a stage for these divides to play out. 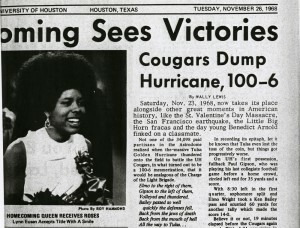 The day of the election, the Daily Cougar ran an editorial (pictured here) imploring the student body to get over their “hang-ups” regarding color, to “exercise student power,” and elect a queen that “would represent… a liberal-minded, progressive student body.” A coalition of student groups and organizations rallied around this idea of a racial integration that broke down the walls of these parallel universities and they turned out to vote. Eusan was already involved in arguably larger social justice issues being tackled by the AABL on campus and in the community. She worked to help establish and promote the new S.H.A.P.E. Community Center, she contributed to Voice of Hope (a newspaper covering the African-American community in Houston, they would later establish a scholarship in Eusan’s name), and her AABL organization would be instrumental in establishing the African American Studies program here at UH. Therefore, her candidacy, campaign, and eventual crowning as homecoming queen became more a sign or emblem of a movement building on campus rather than some prize won in the end. In retrospect and compared to her work, it seems almost trivial. A crown. A tiara. Some flowers. For one moment, though, on the floor of the Astrodome on November 23, 1968, a coalition of students who had previously felt stripped of their voices rallied around a queen celebrating in disbelief. Only three years later, in 1971, her life would come to a baffling and tragic end. The University of Houston would dedicate the park in her honor in 1976. While the cultural and racial novelty of her being crowned homecoming queen will likely remain the lead attached to her life and legacy, the social and ethnic diversity that constitute the University of Houston in the 21st century is due in no small part to her work. No. Racism has not been eliminated at UH, but we are not alone in carrying that burden. However, as one of the most ethnically diverse research universities in the nation, reaping the benefits from its truly integrated global village on a daily basis, UH owes a debt to a movement that championed a woman like Eusan for a title like homecoming queen. Here in Special Collections our University Archives offer a handful of items related to Eusan for study. In addition to the aforementioned back copies of the Daily Cougar, we are pleased to offer a number of items that may be of interest. Our African American Studies Records have materials related to a tribute to Eusan, the UH Photographs Collection holds the photo featured above and can also be found over at the Digital Library, the President’s Office Records hold reams of notes, articles, and correspondence providing a blow by blow record of AABL protests and their “ten demands” (as well as the ire and passions of a divided community), and Professor Patrick J. Nicholson Papers outline the work behind the scenes to establish what would eventually become the African American Studies program. As we ring in a new era for Lynn Eusan Park, take an opportunity to explore and celebrate a life that tells a story unique to the University of Houston. As we move into summer and the campus din quiets down, remember that we remain open for study and eager to assist your research. This weekend the University of Houston campus will welcome over 30,000 visitors as we host Houston’s March for Babies, a fundraising event that has become a mainstay for the March of Dimes in their efforts to improve the health of babies. While the mission of March of Dimes has evolved over the years (having been founded as an agency by President Franklin Roosevelt to battle polio), their commitment to the health of newborns has made the March for Babies an event to rally around year after year. However, fundraising for the March of Dimes does not begin and end in Houston on one weekend in April. The grind and grunt work of charitable fundraising is a year-round job and no name is more synonymous with that exceptional effort than the first lady of philanthropy, one Carolyn Farb. The March of Dimes as well as so many others have benefited from her tireless efforts over the years. Author of How to Raise Millions: Helping Others, Having a Ball! A Guide to Fundraising as well as The Fine Art of Fundraising: Secrets for Successful Volunteers (with an introduction from Robin Leach), Farb has been involved in fundraising in Houston since the 1970s and we are pleased to offer for study a vast treasure trove of her personal papers. 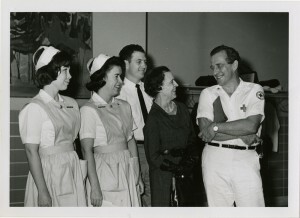 It would be quite impossible to list here the number of charitable and non-profit organizations that have benefited from Farb’s efforts but, as the campus gets set to host the March for Babies, a journey into her archives sheds light on just some of her work with the March of Dimes during the 1970s and beyond. 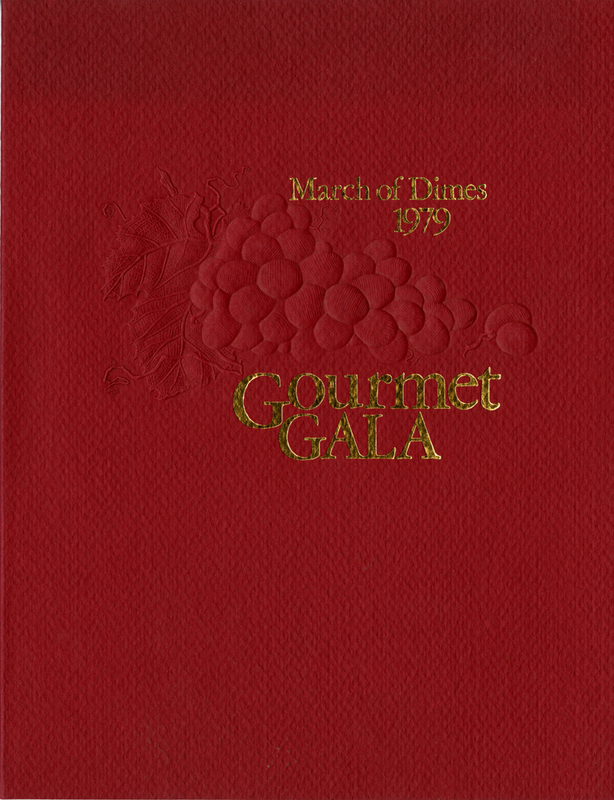 In 1979 the old Summit sports arena hosted the March of Dimes Gourmet Gala that pitted local and national celebrities against one another as would-be chefs, preparing culinary concoctions in kitchen stations conceived by some of Houston’s top designers. 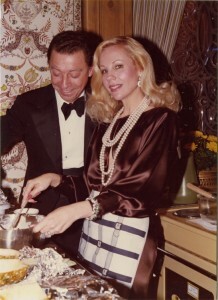 Bernice and Bob Welch of Houston would take top honors with their symphony of Shrimp Crepes with Brie and Pinenut Sauce, but the Baked Alaska of Carolyn Farb and her partner, fashion designer Jimmy Galanos, held its own as it took home the second place prize. Of course, the March of Dimes and the children they serve were the real winners that evening. 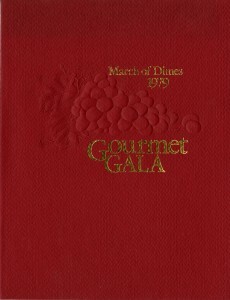 Photographs, press coverage, and artifacts from the 1979 March of Dimes Gourmet Gala provide just one whimsical snapshot of Farb’s work in fundraising. For a more robust picture of the resources available related to Carolyn Farb and her charitable work, take a look at the detailed finding aid. As the spring semester winds down and students scramble to the task of final exams, opportunities for research on Saturdays are dwindling. Be sure to take some time to come see us on Saturday before you go out and March for Babies on Sunday. University of Houston Special Collections recently acquired a new addition for our Kenneth Patchen Collection. 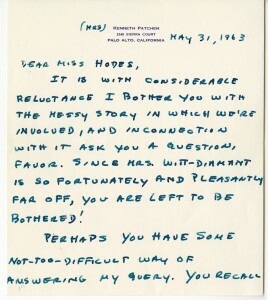 This nine page letter from the poet’s wife, Miriam Patchen, to Ida Hodes is dated May 31, 1963 and includes Ms. Hodes’s response. 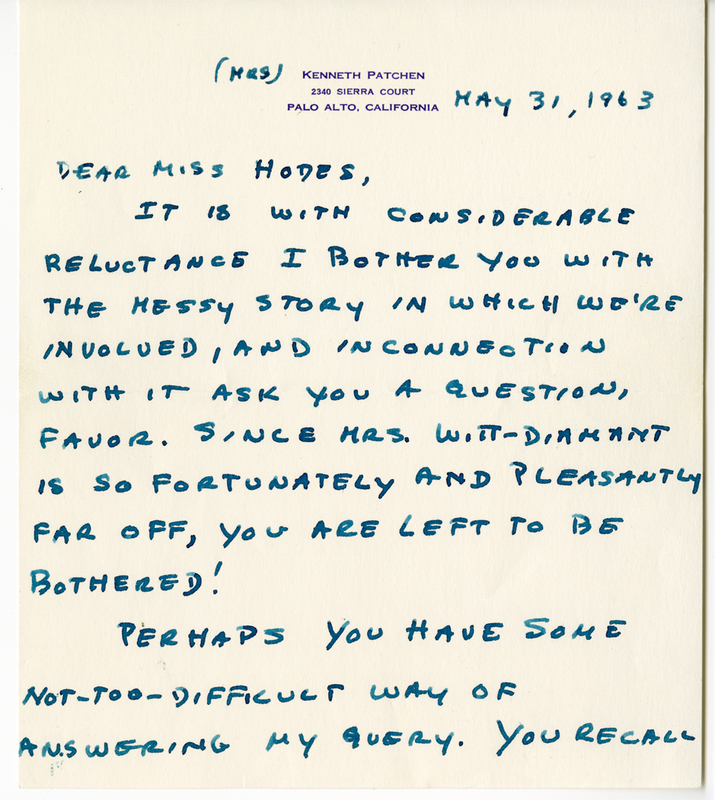 The letter highlights the physical and financial struggles of both Kenneth and Miriam and will be included alongside other correspondence in the collection. 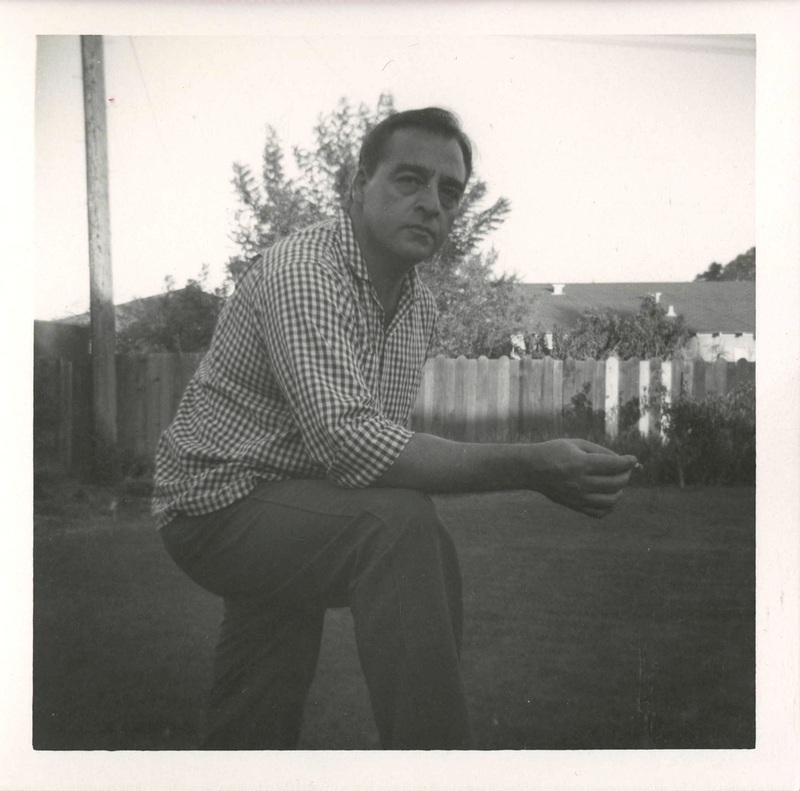 The arc of Kenneth Patchen’s life and artistic career reads like an outsider artist archetype. Born in Niles, Ohio in 1911, his father was a steelworker in the heart of the nation’s thriving foundry. A ravenous reader and writer at a young age, Patchen sidestepped his blue-collar inevitability to forge and enter an artistic world. Earning a scholarship to Alexander Meiklejohn’s Experimental College at the University of Wisconsin in Madison, Patchen would have his first taste of publishing success (a poem in the New York Times, no less) and cut his formal education short, traveling around the country, writing, and working odd jobs for a number of years. It was during this time he would meet Miriam Oikemus, with whom he would spend his life as she worked beside him and cared for him while he battled crippling pain from a back injury he suffered in his twenties. 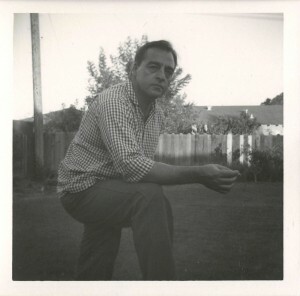 Before there was the stereotype of the beatnik poet capped by a black beret, reading poetry in a coffeehouse while the lurid notes of jazz trip through the smoky air, Kenneth Patchen was appearing in nightclubs along the West Coast, reading on college campuses, and recording with jazz ensembles. Before the Beat Generation’s seething and bubbling of the 1950s threatened to explode into the counterculture of the 1960s, there was the small, devoted following of a poet named Patchen, who had a habit of mixing his media. His poetry spoke too boldly to simply be confined to the page as he experimented with poetry-jazz (the mixture of the language of poetry fused with the improvisational medium of music) and the picture poem (where the words are given opportunity to play off the visuals of the paint). first page of the new acquisition. Patchen struggled with pain, however, and the financial impact was pronounced. Fellowships and income from publishing no doubt helped, but limited ability to tour, lecture, or give readings kept money tight. A surgery fund established by fellow poets (including such luminaries as T.S. Eliot, e.e. cummings, and W.H. Auden) helped and, with proper medical care, Patchen seemed to be headed towards a better quality of life. It was the 1959 surgical debacle however, resulting in severe injury to his back, that left Patchen bedridden for the majority of the last 13 years of his life. By the time he passed away in 1972, Patchen had published 43 books of poetry, prose, and picture poems, though his creative successes were no doubt cut short by the physical pain with which he struggled. The balancing of finances as well as the day to day drudgery and heartache proved difficult for both Kenneth and Miriam as we see highlighted in this new acquisition. 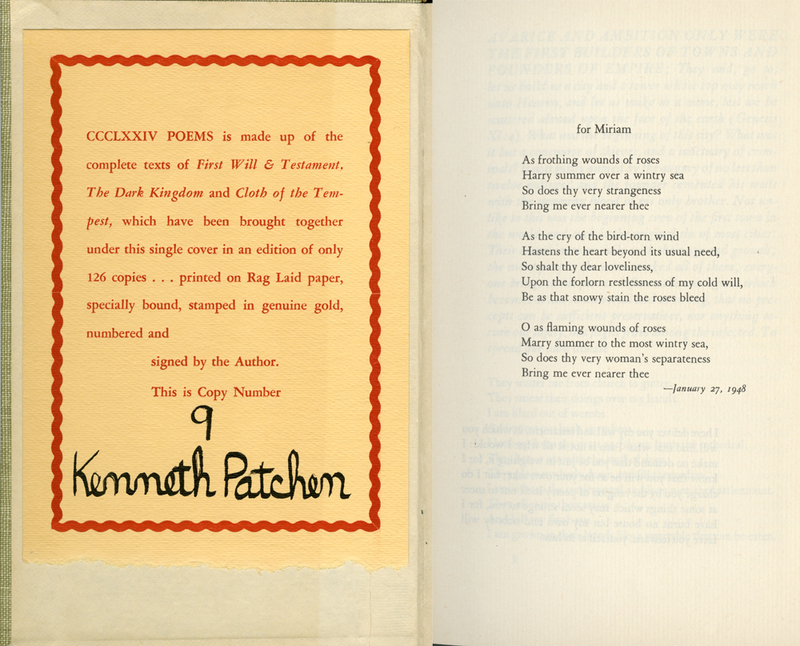 Kenneth Patchen would pass away in 1972 while Miriam Patchen, to whom Kenneth would dedicate all of his works, passed away in 2000. 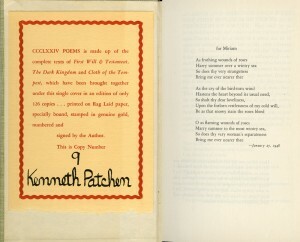 A number of Patchen’s works are available in a variety of media in Special Collections. If you see something of interest, please let us know and we’ll set it aside for your visit. Of course, no trip would be complete without a peek into Patchen’s papers, a collection including materials related to his diverse creative works and their promotion as well as personal correspondence and photographs. 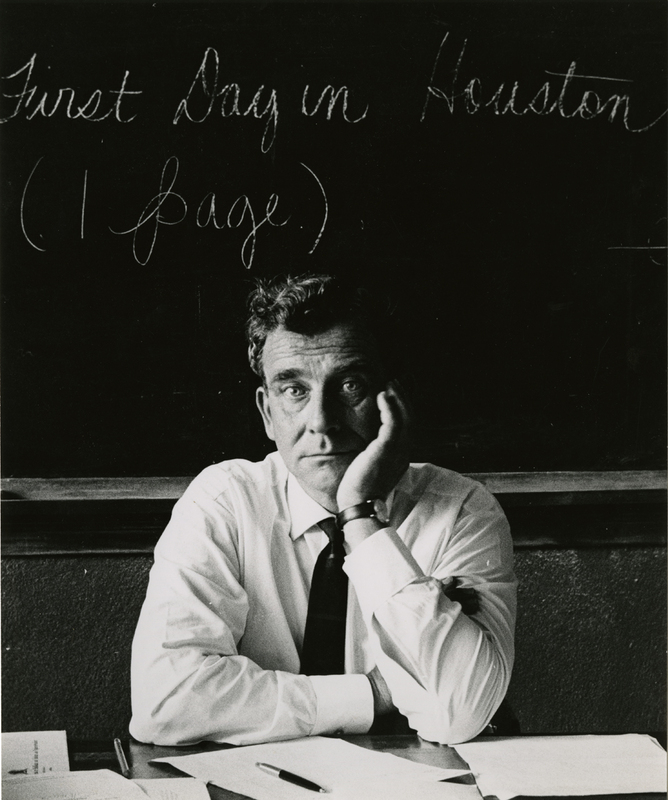 Jan de Hartog (1914-2002) was born in Haarlem, Netherlands on this day in 1914 and, while he passed away from us nearly eleven years ago, we would like to offer our warmest birthday wishes here at the University of Houston Special Collections. A prolific novelist and playwright, de Hartog may best be known for his play “The Fourposter” (winning the Tony for Best Play in 1952), his historical novel The Peaceable Kingdom: An American Saga, but his connection with Houston will be forever cemented with his non-fiction memoir The Hospital, a work that helped transform healthcare in Houston. Having recently moved to the United States, Jan began the work of his residency at the University of Houston while Marjorie de Hartog began volunteering at the old Jefferson Davis County Hospital. Realizing the enormity of the hospital’s challenge as it tried in vain to serve those with nowhere else to turn, she shared with her husband her exasperation over the demand that seemed to dwarf the resources. This became the impetus for the writing and publication of The Hospital. The book, giving voice to the frustrations of some of the city’s most vulnerable and needy, certainly had a national impact, but its influence on local involvement in healthcare policy and funding in Houston was immediate and lasting. As a result, Jan de Hartog’s connection to the city would be permanent. He passed away in Houston in 2002 at the age of 88. Here in Special Collections we are happy to have the papers of Jan de Hartog available for study. These papers include correspondence, press, and materials directly related to the writing and publication of The Hospital as well as the reaction and support of the community following its publication. While this transformative work is sadly out of print, it is available for checkout in the M.D. 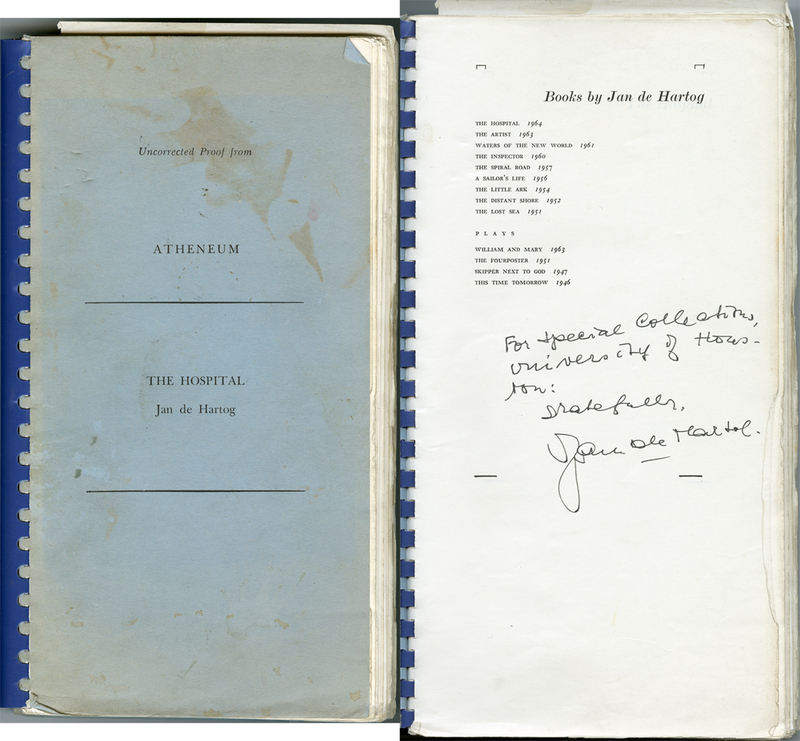 Anderson Library (among others) and we are also pleased to offer for study a publisher’s proof copy of The Hospital inscribed by the author. We invite you to celebrate the legacy of Jan de Hartog. 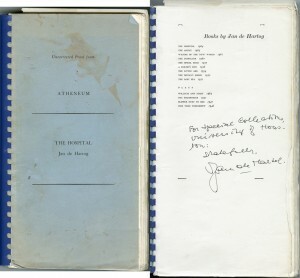 Take a look at the detailed finding aid outlining the materials in the collection, take a look at our catalog of his works, and stop by and wish him a happy birthday (belated or not) when you have the time. Exciting news from Special Collections: The DJ Screw Papers are now available for research! 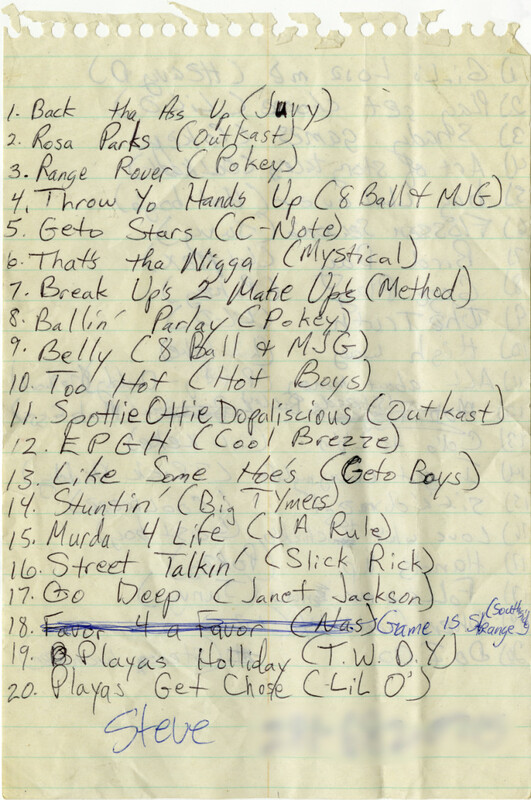 This small but important collection is a cornerstone in our Houston Hip Hop Collections and documents the influential late hip hop artist DJ Screw’s activities as a DJ and mixtape creator. Some of the materials in this collection are available for online viewing in our DJ Screw Photographs and Memorabilia Digital Collection. 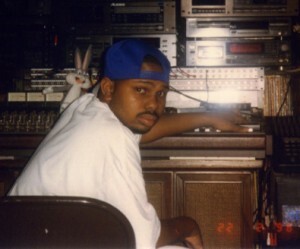 DJ Screw began DJing and making mixtapes as a teenager while living on the Southside of Houston. By the early 1990s, he began to develop his innovative “chopped and screwed” technique of using recording technology to repeat phrases (a process known as chopping) and slow a song’s tempo (known as screwing). 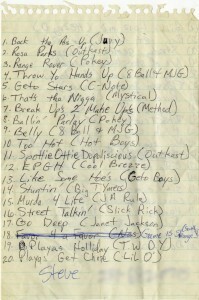 DJ Screw began to receive requests to make tapes tailored for friends and local rappers. He began selling copies of these “screw tapes” from his home. The screw tapes helped to develop the careers of numerous major rappers in the Houston scene, who would subsequently become known as the Screwed Up Click (S.U.C.). DJ Screw achieved broader popularity in the mid-1990s, and he continued to sell tapes while releasing four studio albums on Bigtyme Recordz: “All Screwed Up,” “3 ‘N The Mornin’ (Part One),” “3 ‘N The Mornin’ (Part Two),” and “I Wanna Get High with Da Blanksta.” In 1998, DJ Screw opened the store Screwed Up Records and Tapes in order to meet demand for his mixtapes. Especially interesting items in the collection include song lists for the screw tapes, music production equipment, business documents, and photographs. If you’d like to take a look, come visit us in Special Collections!